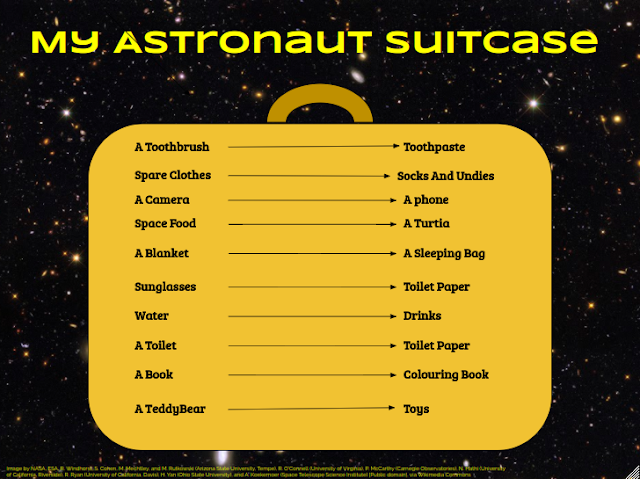 We wrote a story about finding somewhere else to live in space because we had destroyed planet earth. Here is my animation about finding a new planet to live on. This morning the whole school walked down to the Tamaki Estuary to support our students and manuhiri as they went fishing to catch baby flounder for our Flounder Project. Our beautiful singing brought blessings and good luck as many baby flounder were caught in the net. They have been transferred to our flounder tank to grow into healthy adult flounder that can be returned to the awa when they are ready. We have been learning about writing a formal email this morning. Here is my slideshow. Yes, Duffy would have been so proud if he had come across Room 9 this morning. SSR in the sunshine! 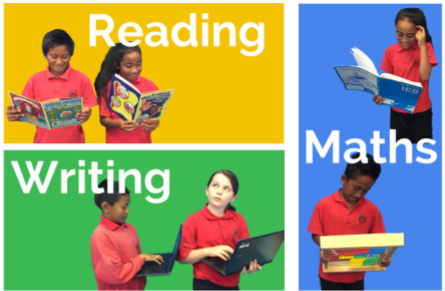 While our library monitors finished off their jobs, it was wonderful to catch everyone engrossed in their latest library books before we returned to class. Ka mau te wehi! As part of our learning about Guardians of the Galaxy, we read a Connected article called Shrinking the Solar System. 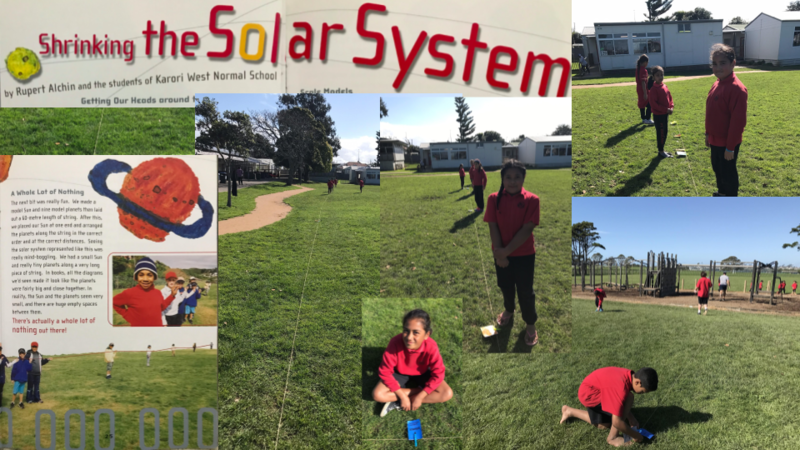 To get an idea of how enormous the solar system is, some students at Karori West Normal School in Wellington pegged the "planets" along a 60 metre long rope to show the distances between them to scale. We decided to do a similar learning activity on a beautiful Friday afternoon. Using a 100 metre rope on the school field, we worked together in different groups to explore the distances between the planets in the solar system. We worked out that if we pegged the sun at one end of the rope, the Kuiper Belt would be 100 metres away using our scale. The sun, Mercury,Venus, Earth and Mars are all in the first four metres of the rope - that's four big paces. It's a very, very long way (about 25 metres using our scale) from Neptune to the Kuiper Belt. As it says in the Connected article, there's actually a whole lot of nothing out there! 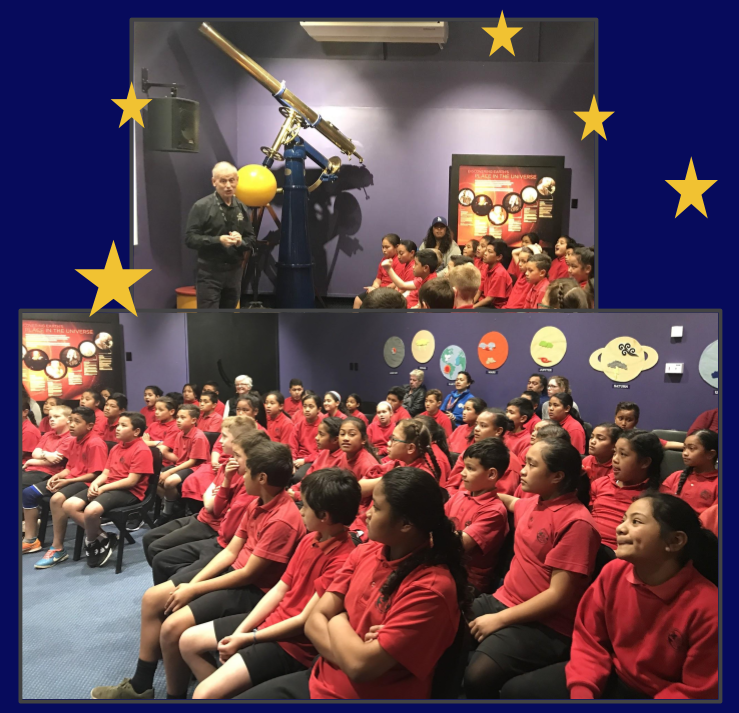 The stars were twinkling at Stardome as Rooms 9 and 10 learnt more about the solar system and life beyond earth yesterday. As well as finding out information by reading and looking at the displays, we were treated to John's expert knowledge of the planets and their moons before we sat back, relaxed and enjoyed the show in the planetarium! Jarreka is learning her 3 and 4 times tables at the moment to help her solve multiplication problems. She decided to create this presentation to help her. 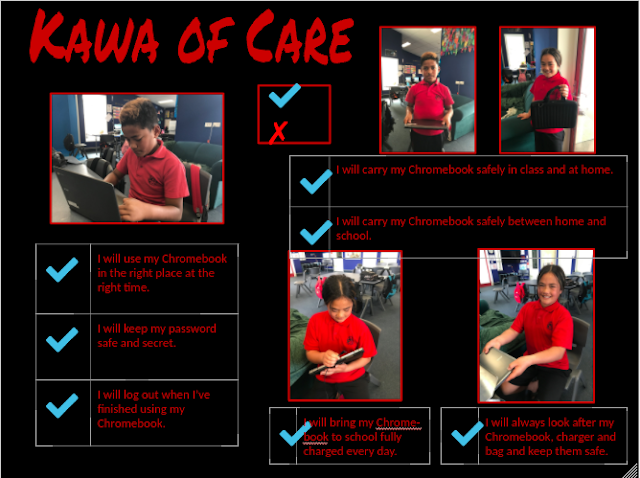 This is how we take care of our Chromebooks at home and at school. Here is a movie we created about this visit which was shared with PES on PENN today. As you will see, we had so much fun! 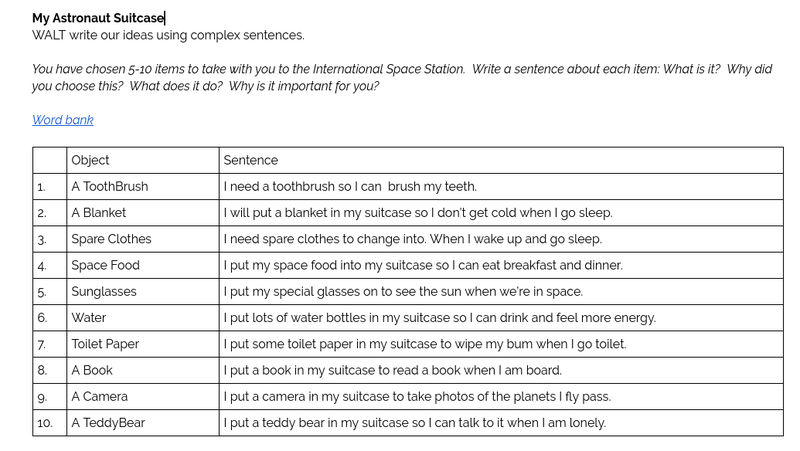 Walt: write our ideas using complex sentences. and somethings that describe it. I also wrote things that are important to take and that are things that you can do if you are board. Description: This activity was to do sentences about what you should take to space in a suit case. 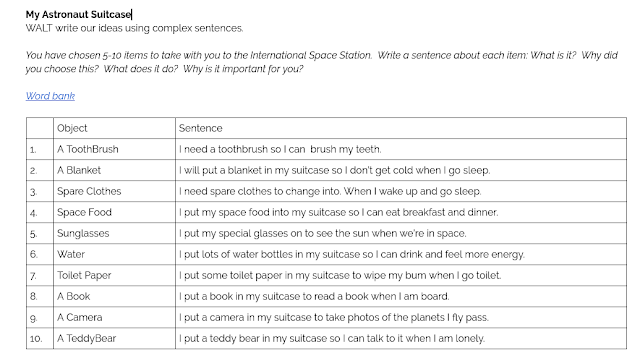 We also had to write sentences about complex sentences of why you might need them. We had to do one sentence for each word. What a beautiful afternoon for the annual Point England cross-country event. 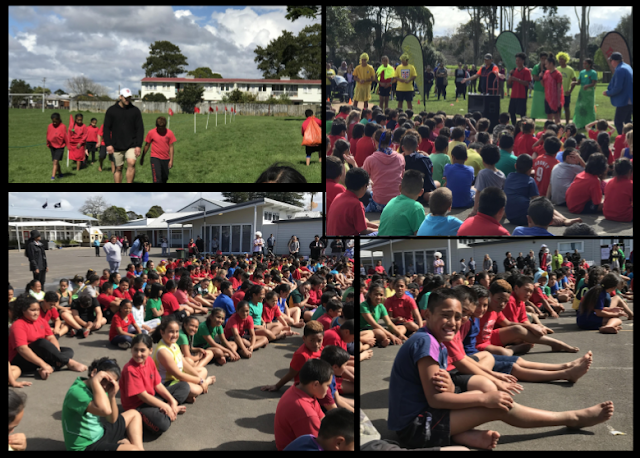 We enjoyed the sunshine as we watched others run and then took our turn to run the 1.5 km course around Point England Reserve and the school field. It was wonderful to see everyone trying their best in the muddy conditions. We also had heaps of fun this morning helping Miss Va'afusuaga by checking that the course was free of rubbish, sticks and tree branches. In the end we found more puddles and mud to explore than rubbish to pick up!